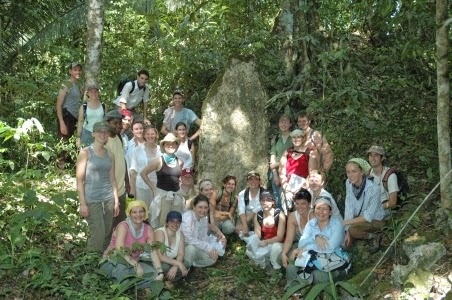 The Rio Bravo Archaeological Survey provides college-level instruction in archaeological field methodology within a state-of-the-art research project at an ancient Maya commoner site in northwestern Belize. In 2015, teams of veterans, students, and volunteers will rotate between excavation, digital survey mapping, and laboratory activities as they investigate the densely distributed, forest-covered remains of household structures, residential terraces, relic water-control systems, and one of the only known Late Classic-period (A.D. 600-850) commoner ballcourts. The settlement-- mostly consisting of covered mounds under 2m tall-- extends for a kilometer along the sloping surface of the 200-foot Rio Bravo Escarpment. Come help us explore the complexity and sophistication of Maya commoner life at the close of the Classic period. An optional 3, 6, or 9 academic credits are offered through the Community College of Philadelphia or the University of Texas at Austin. Non-credit volunteers are welcome. Visit our website for more! Next topic: "Intensive Practical Course on Roman Archaeology 2015"
Previous topic: "Leicester Distance Learning (initial impressions)"